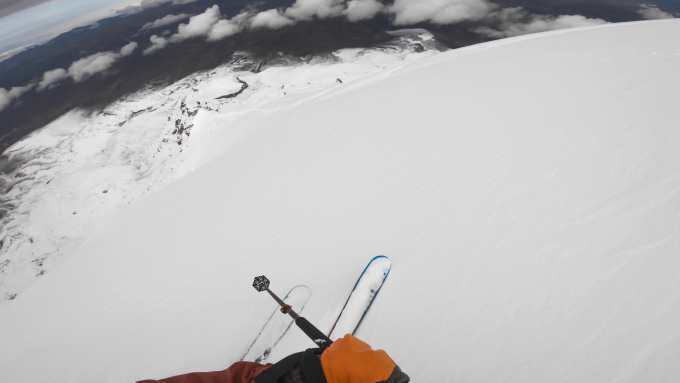 Avenida De Volcanes – Summiting and skiing Ecuador’s Avenue of Volcanoes. 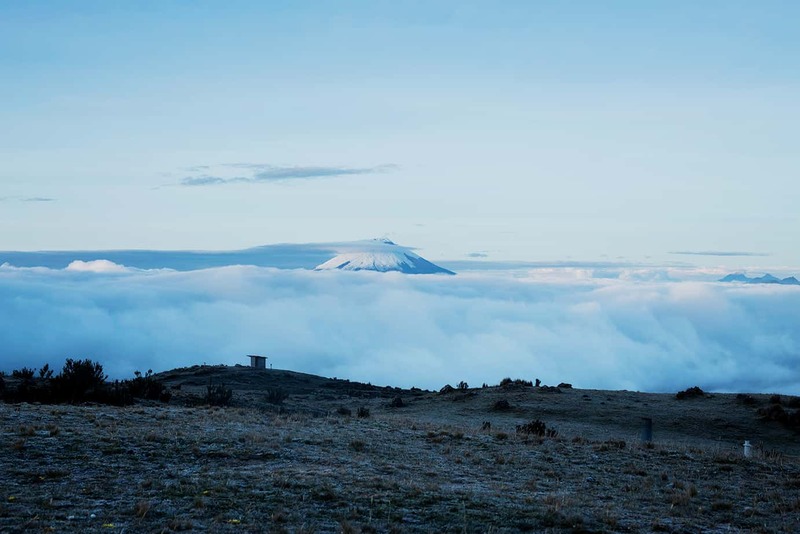 Cotopaxi poking through the clouds on a frosty morning at Anitsana base camp. 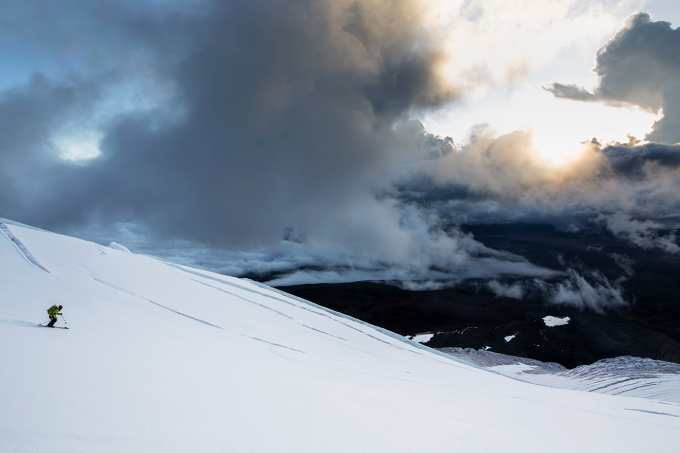 Unfortunately, conditions didn’t look promising for a ski descent of Cotopaxi, so we didn’t make an attempt. 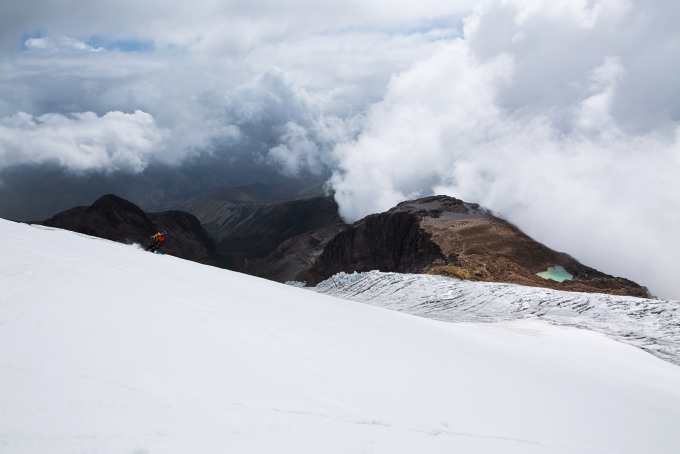 A week later Michelle Parker and Emily Harrington made a successful summit and ski descent off the back of the same snow we experienced on Chimborazo. As Australians, we are constantly marginalised in the snow sports world. People often can’t believe we produce world class snow athletes (we can and do). We’re pigeonholed as having domestic skiing that’s thought of as, “Why bother when you can go to Ja-pow-pow”*, when we all know that when it’s on at home, it’s as good as it gets. I grew up in this environment. 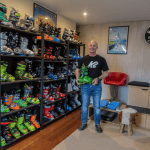 With this sentiment running rife throughout the community, it instilled in me a sense of teenage-like rebellion when it came to places you could ski. As I grew older, I was lucky enough to travel to some of the world’s most prolific and popular snow destinations. Despite this, I found myself yearning for something different. I couldn’t help but think, where else can you ski? Where can you get off the beaten track and find snow where most people would never think possible? So, I was always on the lookout for unique places where you could make a turn on the white stuff. 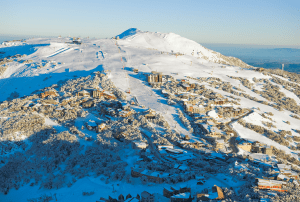 The mission – skiing 5000m-plus peaks on the Equator. .
During a particularly hot February night in my native Jindabyne I had long session of Googling and click-through links and stumbled across some info on skiing in Ecuador. I was intrigued. 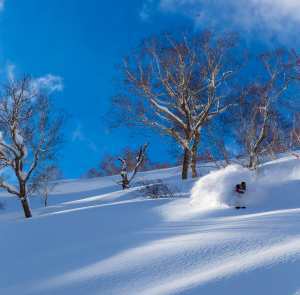 Skiing in the tropics, how is that possible? The first thing that struck me was the sheer height of these mountains. They were all 5000m+ and capped by enormous glaciers. “That’s cool” I thought. That’s the reason they can hold snow at that latitude. Also, they were all volcanoes, which is cooler still. 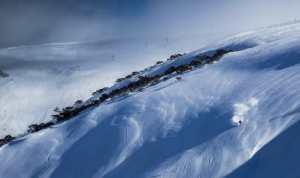 Skiing, volcanoes, glaciers, high altitude? This seemed to tick all the boxes for a unique adventure. After doing some more research I came across more equatorial glaciers – in Uganda, Indonesia, Kenya, and other exotic places. I thought, “Woah, you can ski in all these tropical places, that’s incredible”. But the more I looked into it, the more I realised that these glaciers, these unique, skiable areas were disappearing. So, armed with this content and a plethora of new information, I set out to make a film about skiing/snowboarding down some of the most at-risk glaciers in the world: those on the Equator. I needed to get a “feel” for these environments, which are so far removed from the classic winter destinations. I needed a local to show me around and I searched the web for “skiing Ecuador” and found Pablo Puruncajas, a local who comes from a long line of mountaineers. 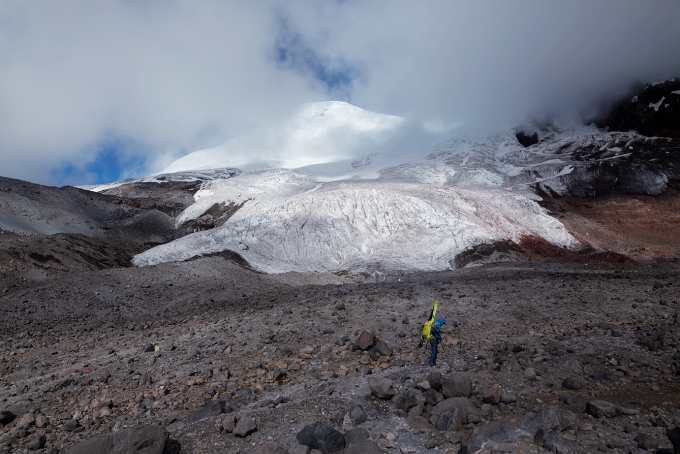 Pablo grew up in the shadow of Chimborazo, the highest mountain in Ecuador, and he was climbing these volcanoes with his father, a mountain guide, as early as 10-years-old. Pablo had guided on Denali, Mount Blanc, Renier and more. 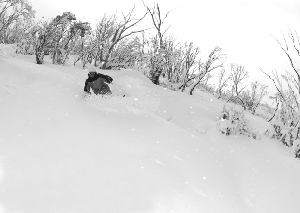 He was local and a passionate skier, an essential prerequisite for what I wanted to achieve. He was my guy. After reaching out, Pablo wrote back, sounding excited. “Sure, we can ski mountains in Ecuador,” he wrote back to my enquiry. “What are your dates?”. 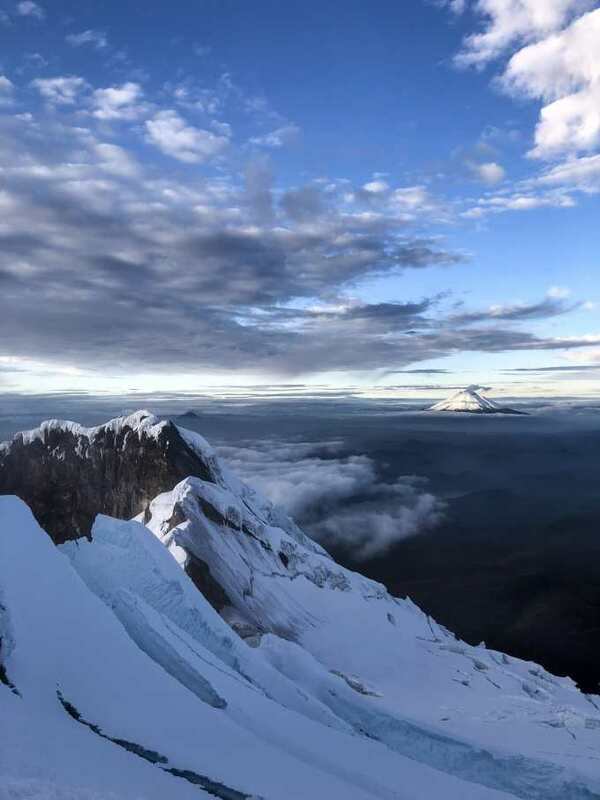 And with that, I locked in a 15-day schedule, which involved acclimatising in the low lands, then summiting and skiing three volcanoes in the “Avenida De Volcanes”, the Avenue of Volcanoes, in the Ecuadorian Andes. 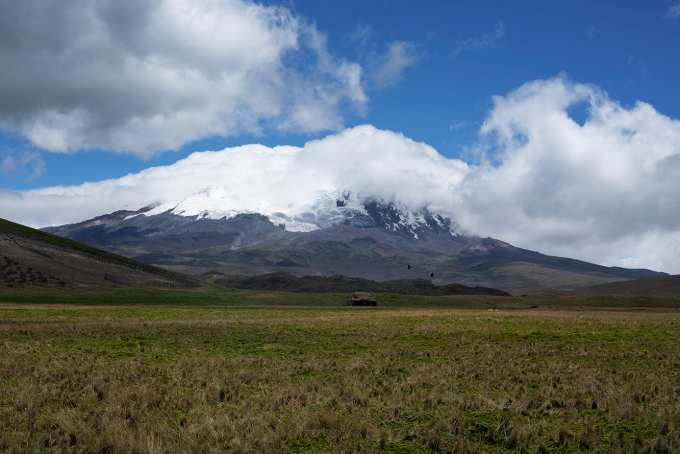 The three volcanoes are Cayambe (5790m), something special as it sits on the Equator which you drive over on the way to the refuge; Anitsana (5704m), the fourth highest mountain in Ecuador, but one of the most technical for climbing, and Chimborazo (6263m), the big daddy, taller than anything in North America, even Denali. The first thing I’ll mention about big mountains, in general, is how hard everything becomes at altitude. Despite time spent trekking at altitude in Nepal, I underestimated how the most menial of tasks become a mammoth effort once you’re above 5000m, even with proper acclimatisation on some of the smaller peaks in the region. After a few acclimatisation days, and a heavy bout of “gringo guts” (debilitating food poisoning), all three mountains presented different challenges. 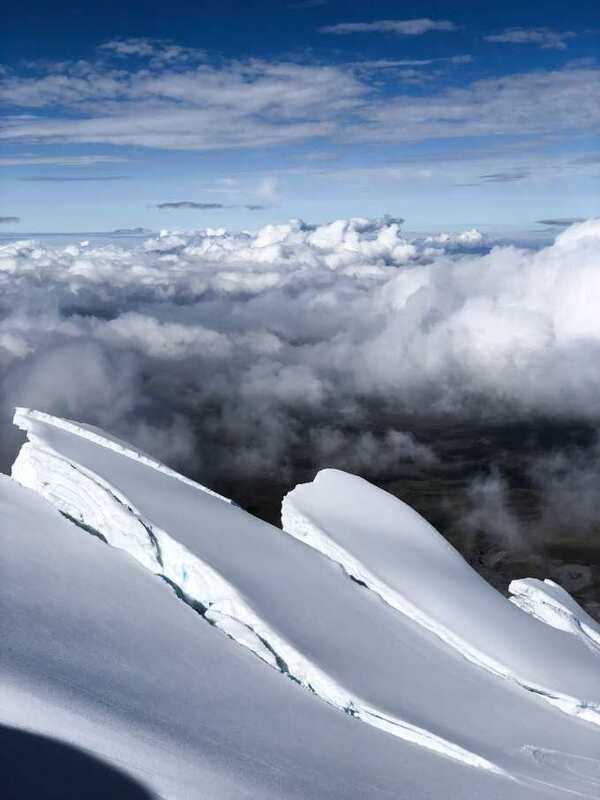 We headed up high for our first ski tour day, to our first glacier, on Cayambe. We did two afternoons touring on the lower glacier where I had my first taste of tropical snow. Did I mention how hard everything is at the altitude? Your ultralight touring setup starts to feel like downhill skis once you get above 5000m and I was completely wrecked after our first ski tour day on Cayambe. 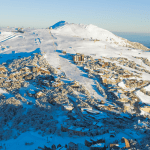 I learned that my frantic’go hard and straight up’style of ski touring that I developed on the Kosciuszko Plateau was not suited for high altitude. I wore myself out after only a few hundred metres of vertical climbing. Pablo ripping into a turn on the upper slopes of Cayambe. Pablo wore stretchy, rock climbing jeans for most of our ski days. We used the two days exploring the lower mountain to find a route that we could ski down. 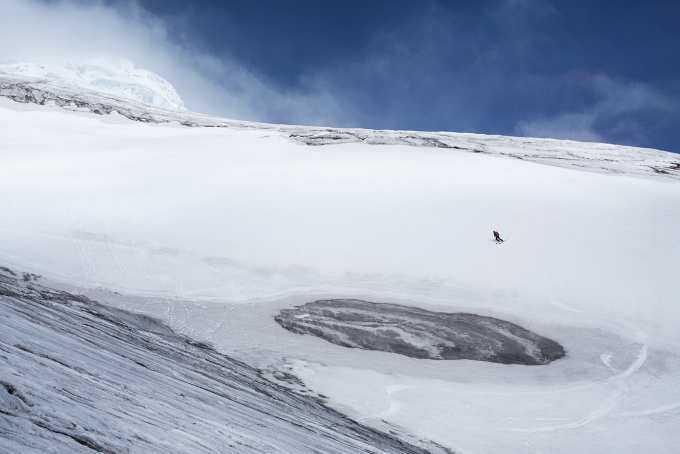 This became a common practice because even though Pablo had been skiing on this mountain a few weeks earlier, the glaciers were so active that the skiable routes changed week to week. 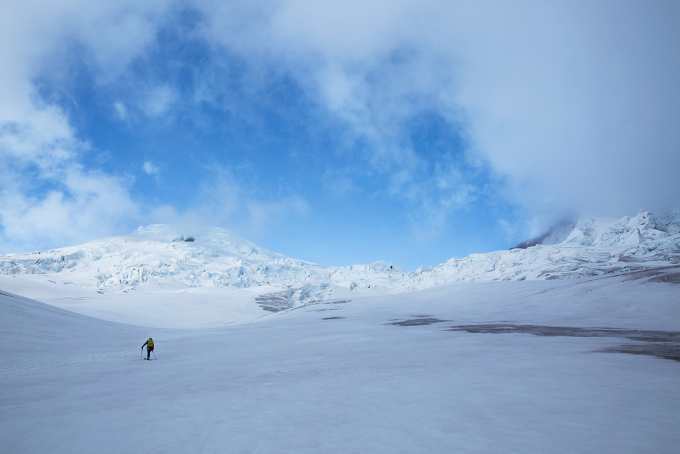 On Antisana, during one of our first route-finding missions, we discovered that the regular climbing route was almost impassable due to the glacier moving, a fact that no-one had alerted us to, because no-one had been on the mountain for a while. 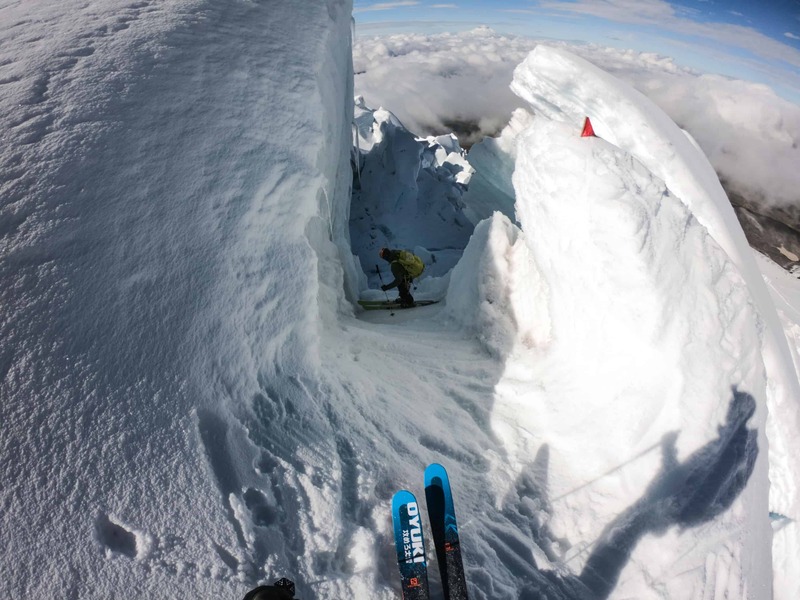 Scouting routes, for ascent as well as a ski descent, was an essential part of the process. In true alpine assault style, we left at night for our summit attempts, anticipating a 7am summit. I was still suffering the effects of “gringo guts” on Cayambe. This affliction made the ascent harder than it should have been. My dehydration was such that I felt as if I couldn’t drink enough water, which made rationing hard. But, I pushed on, I wanted the summit. At one point on Anitsana there was another sketchy crevasse crossing. It was dark, and I stepped onto the snow bridge with my right foot, it seemed fine. Then when I put my weight onto my right foot to move my left…. the bridge gave way. I fell, straight down, into the dark abyss of the massive crevasse below. It’s hard to explain how helpless you feel when falling, even if it was for a second. Luckily, my fall was abrupt. I fell to my shoulders, caught by my skis strapped to my backpack and some weight of the rope attached to Pablo. I was dangling over a crevasse that was 100m+ to the bottom. Fortunately, I could swing my legs onto another part of the snow bridge. I managed, after five terrifying minutes, to climb up and roll back over onto the safety of the ledge. After a brief moment to catch my breath, I got up and I crossed the crevasse, far more careful this time, and we continued. 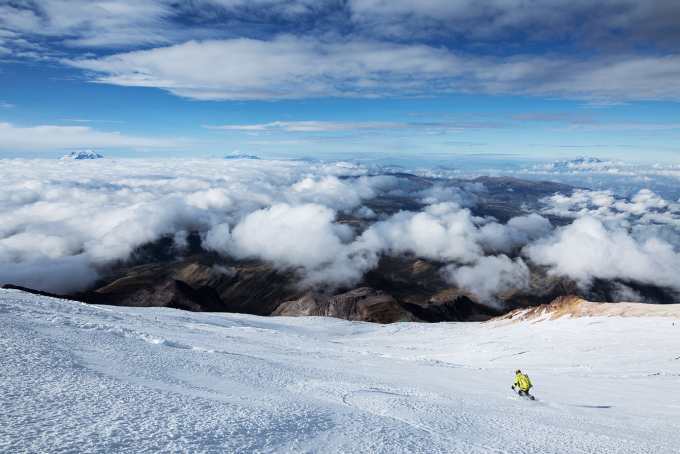 On Chimborazo the ascent got arduous at about 5800m. Every step was laborious, compounded by the fresh snow causing our ski cuts to not hold up. We were sliding with every move, it was a “one step forward, half-step back” situation. Most of the other climbers who were attempting to summit turned around. They passed us on the way down stating that the avalanche risk was too high to continue. Pablo and I knew the snowpack was stable and the risk of a slide was low, we kept going. The keyhole in our route. It was rock solid ice, steep and narrow. Not ideal, but a fun challenge. The final push was demanding and every step above 6000m was strenuous, like “I wanna turn around” hard. We had conceded that our ski cuts were not working and ski touring up was becoming futile on the steep slope, the fresh snow making it near impossible to keep pushing through on skis. We opted to strap the skis to our backpacks and continue to the summit on foot. At this point, my lightweight backpack felt like it was full of bricks. After around seven hours of hard slogging it out (a total of nine hours on Chimborazo), we arrived at the summit, jubilant and fulfilled. View from the summit of Anitsana. Cotopaxi in the background is active, you can tell by the plume emanating from the summit. The view from the apex of each of the mountains was amazing and we were lucky and had clear skies for all of our summits. 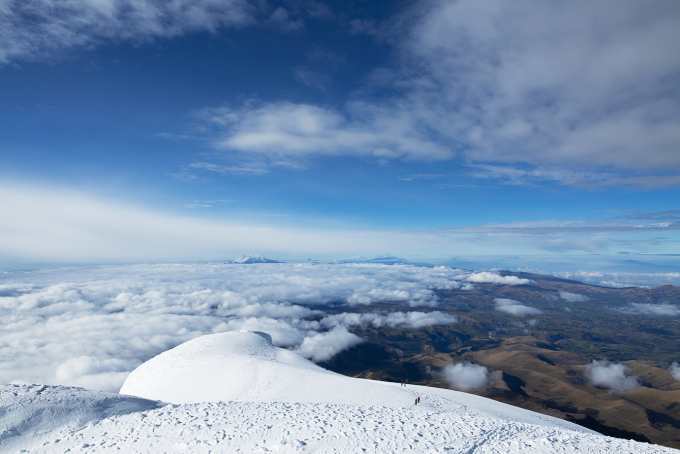 I got my first glimpse of the Avenida De Volcanes on Cayambe. 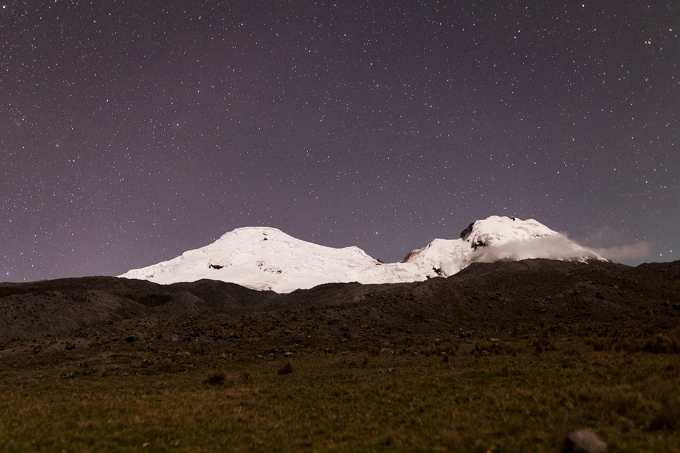 To the south, in full view was Antisana (5704m), Cotopaxi (5897m) and, in the distance, Chimborazo (6263m). Climbing Chimborazo was special. The view from the top was incredible, one of those moments that changes your life. Here I was, the highest I’d ever been (above sea level), looking out at a very large part of Ecuador. To my north, Cotopaxi, Antisana, and Cayambe poked through the low clouds in the valley. Delirious from the altitude, I had an epiphany. The indescribable feeling that I was experiencing, a combination of agonising pain and pure elation, mixed with complete contentment – this is why people climb mountains. All the hard work, the falls, the risk, frostbitten fingers. It is all worth it when you are standing on the summit looking down, knowing you’ve put yourself through hell to get there. It was a pretty surreal moment. 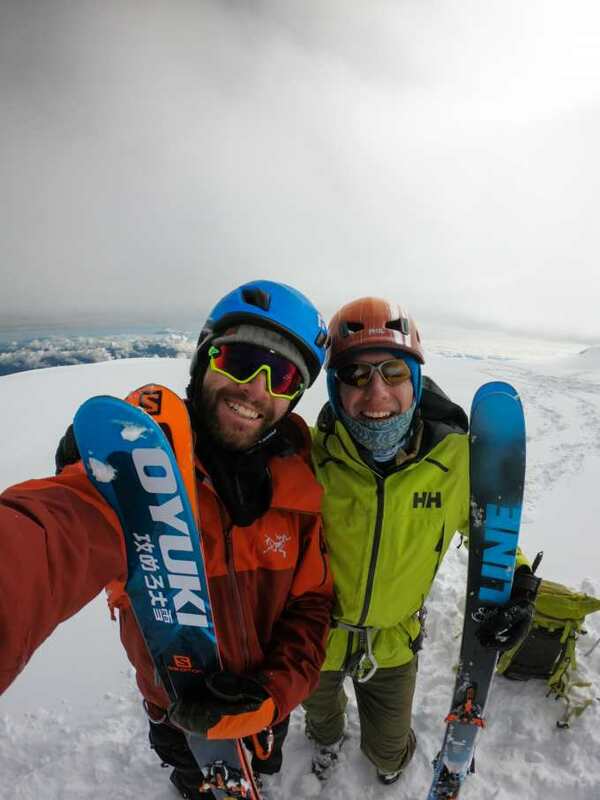 Lucas, left, and Pablo on the summit of Chimborazo at 6236metres (20,460ft), elated but tired after a nine-hour climb. After scoffing some food and getting our gear ready, it was time for the fun part. After all, we were there to ski. 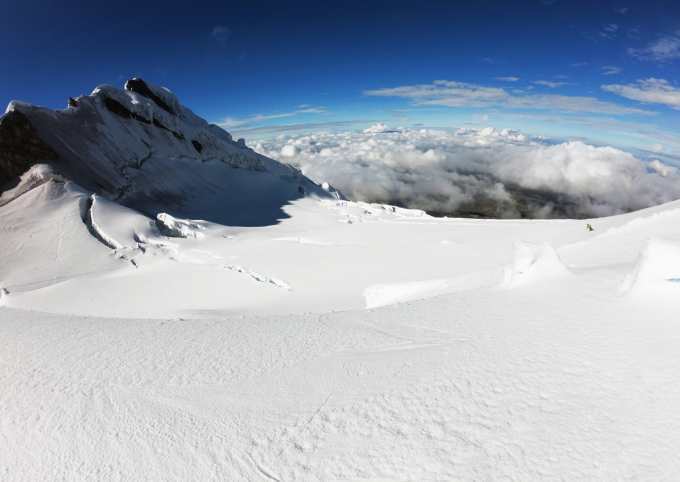 The snow quality on Cayambe and Antisana was decent considering there hadn’t been a lot of natural snow recently. Pablo noted that lately it rained on these mountains with more frequency and rarely snowed, a troubling thought. The views were incredible though, an unobstructed vista all the way to the lowlands, masked by a thin veil of wispy clouds that blanketed the lower valleys. 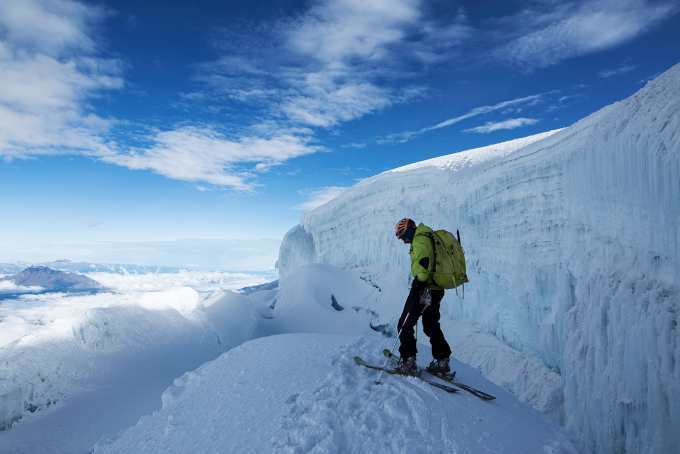 It was hard to concentrate on avoiding the many crevasses, holes, seracs and usual glacier fodder that dotted the slope. The combination of amazing views and pure exhaustion made sure of this. It was almost an ethereal moment. There I was, skiing down a mountain, on the Equator, with a full view of the tropical jungle below. Maybe I was a little delirious from the lack of sleep. Perhaps, I was exhausted from the climb, but it was somewhat spiritual. On Antisana the terrain was difficult. It involved a lot of ski mountaineering style travel. It was fun, albiet a little scary. Pablo avoiding crevasses on Antisana during an epic sunset. Chimborazo was a different story. Powder. Skiing 30cm of powder? In the tropics? Now that’s something you don’t do every day. And for good reason, the conditions we were experiencing were once in a blue moon. We dropped in, I made a few turns and they were good, like “good” good. I’m not going to lie though, I was completely drained, and it was actually hard to ski down, even with the perfect conditions we had. But, it was magical all the same. Turning and getting face shots, whilst looking down at the lowlands below was an incredible experience, one I’ll hold onto forever. After some nice turns, we navigated our way through the technical lower sections. With the sunrise, these sections had become a minefield for exposed rocks. There were “shark fins” everywhere. It wasn’t the most pleasant way to finish the climb. By this time, I had a one-track mind – “get me to the refuge”. I was ready for a rest, or a beer. Finally, we zigged and zagged our way to the trail and made it back to the hut on foot. A feeling of accomplishment usually followed each successful ascent and descent. Anitsana was littered with huge seracs. This made the route finding very difficult. After my experience, I’m hungrier than ever to make a film about these amazing glaciers. The issue of climate change is contentious, no matter who you are. My personal belief is that the facts are there, it’s happening, and we as humans are helping. As a lifelong skier and someone who relies on snow for my livelihood, this scares me, a lot. After talking to and hearing from a lot of the locals, they all agree that the glaciers are receding. I overheard many stories like “we used to climb that route, now it’s impassable”. Pablo often pointed out large rocky areas that he said he had once skied. Now, scars of dirt cutting through the glacier. I’m glad that I had the chance to ski these magnificent mountains whilst it was still possible. Scars of dirt now run through the glaciers. With any luck, the effects of climate change aren’t as drastic as they seem to be. So, we’ll be able to ski in Ecuador into the foreseeable future. However, the current situation provides a different story. Time will tell. In the interim, while you can’t stop the world’s emissions from entering the atmosphere all by yourself, and, nobody’s perfect, but you can raise awareness, and do what you can. Protect Our Winters has recently launched an Australian arm, so head to the website and see what you can do to help. I don’t want to sound like a preachy douche, but… recycle, get a reusable coffee cup, carpool, ride your bike, etc. I’m a firm believer that every little bit counts, and if everyone puts in a little bit of effort it could add up to a large amount of positive change. 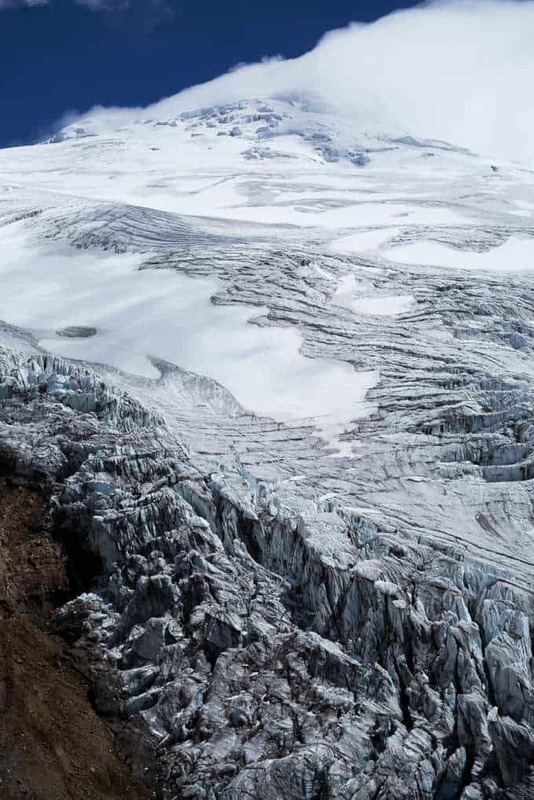 And maybe… just maybe, we can keep skiing these glaciers for years to come. *For the record I don’t condone the use of the term ‘Jap-pow-pow’ or any of its derivatives. It was used for colloquial effect in this instance.